Lip augmentation is extremely popular, but it is not for everyone. Some people have larger-than-average lips that overshadow the rest of their face. Lips that are too full can affect speech and even eating and drinking, which can make you extremely self-conscious. If you feel you have too much of a good thing when it comes to lips, lip reduction surgery may be an option for you. The arch of the upper lip is known as the Cupid’s Bow for its resemblance to the Greek God’s famous bow. For many people, the arch lacks volume and definition, and so they want to lips that are more prominent. The V to Y surgery consists of making three, v-shaped incisions on the inside of the upper lip. The incisions are then stitched together and the flaps of tissue in between are pushed forward. This creates a more defined Cupid’s Bow and a fuller upper lip. he philtrum or Cupid’s bow is a medial depression than runs from the upper lip to the nose and is bordered by ridges. Although it has no medical function, cosmetically it adds depth to the facial features, creating a perky, upper lip and smile. Our features can tend to flatten as we age and the philtrum often loses definition. Some people are born with an unusually long philtrum area with an upper lip that tends to turn under. A surgical solution of shortening the length of the philtrum area is done by making a small incision under the nostrils, the skin there is trimmed and slightly pulled up and stitches are removed one week later. Taking advantage of nature’s fold to hide the tiny scar. Fillers to create the ridges may still be still be necessary once the area has healed. Depressor Anguli Oris (DAO) Release is a procedure performed to lift the corners of your mouth. As you age, the corner of your mouth can turn down and patients often complain of constantly looking angry or sad. In order to have youthful, sensual lips, plastic surgeons now know that shape is far more important than volume.Rather than simply requesting their lips be made larger with fillers, increasing numbers of our patients are seeking beautification through reshaping. Lip reshaping is customized based on your facial structure, tissue characteristics, and aesthetic expectations. Lip reshaping can involve one or a combination of procedures performed either at the same time or in sequence and offers the distinct advantage of being a permanent solution. Corner Lip Lifts are designed to elevate an otherwise drooping outer corner of your mouth. 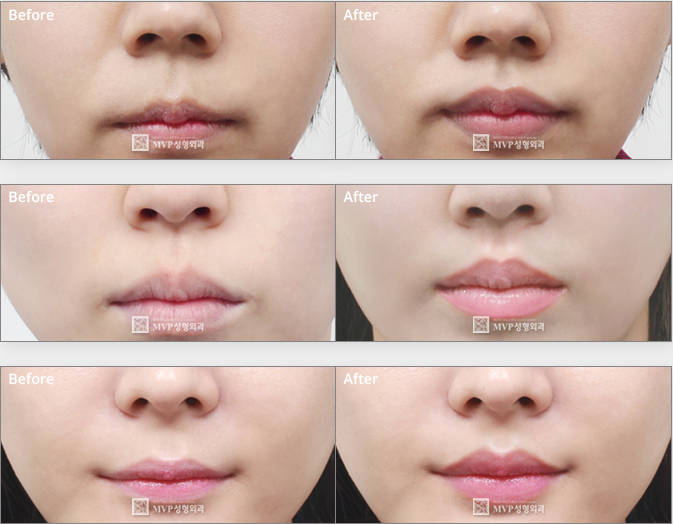 Uneven Lip Correction is an effective technique used to enhance or restore a patient’s lip shape. Technical areas of the Uneven Lip include adjusting the rotation advancement, enhancing the Upper lip line (“M” design/or called Cupid's bow), and addressing any imbalances in size and shape. Lip Scar Removal surgery involves surgical excision of the existing scar in an effort to improve its appearance. Technical areas of the Lip Scar Removal include adjusting the rotation advancement, enhancing the Upper lip line (“M” design/or called Cupid's bow), and addressing any imbalances in size and shape.